The Head Office of Thai Petroleum & Trading Co.,Ltd. is located at its own 25-story building “TP&T Tower” on Vibhavadee Rangsit Road. As a major Lubricating Oils and Greases Manufacturer in Thailand, TP&T owns also a Lube Oil Blending Plant with the capacity of 60,000 MT/year and a Grease Manufacturing Plant with the capacity of 10,000 MT/year. Both plants are fully equipped with modern instrument and machinery for Blending, Filling and Packaging as well as the International Standard Laboratories for R&D and QA/QC. With the strict and consistent Quality Management System, both plants were awarded the ISO 9001 Certification. Additionally, the Company has invested into a Plastic Container Manufacturing Plant. 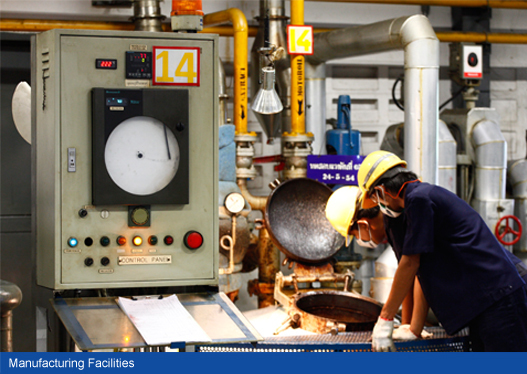 The capacity for this plant is 2,400 MT/year which is sufficient to supply for its lubricant products. Later on, TP&T has diversified into an automotive battery business. The company has fully acquired a local automotive battery company and started manufacturing Lead-Acid Automotive Battery under brand TPS with the capacity of 350,000 Pcs/year. Many high technology machines and processes are used in this Plant such as Grid Casting Machines, COS Machines and other modern auxiliary equipment in the assembly lines. Moreover, TP&T always gives precedence to the Quality as its first priority. It has invested continuously on the Testing Equipment using advanced technologies, such as the measuring equipment for quantity of metallic elements in the lubricants, the performance testers of greases and the most sophisticate automotive battery testers. All equipment is complied with the international standards. The Company also emphasizes on innovation and always keep on the latest development in the industries. This is to ensure that TP&T will always be able to fulfill the customer expectations and to provide customers the greatest benefits.